i went on saturday with our local creative group to an exhibition of the works of danish artist and illustrator otto frello at the museum in varde. i'd never heard of him but i intentionally didn't google him or look at the museum's website before we went. i wanted to have a totally fresh, unbiased first experience of seeing his works. he was, for many years, an illustrator for a danish publisher and didn't start painting until he was in his 40s. he's now well into his 90s and still going strong. while his works weren't exactly my taste and not something i'd want hanging on my walls, i do think they were very interesting. perhaps his most famous work is the copenhagen picture above. the woman at the museum told us that he had once bragged that there was nothing he couldn't paint and so someone asked if he could paint the spirit of the times. and he embarked on this painting of amagertorv in the heart of copenhagen, depicting the many layers of people who had passed through it over the years and years it's been there. from 17th century fishmongers to an 80s punker, times are all mixed and melded and present there in the picture. so while i wouldn't necessarily want it on my wall, even in poster form, i think it's quite a fascinating depiction of the imprints and layers of history that are left behind, whispering in a place, if we were to just listen attentively. and i very much enjoyed the experience of just letting the impressions of something new wash over me, without any preconceived notions of what i would be seeing. it feels like with all of the information we are bombarded with all the time, it's hard to have such experiences - where it's just completely something fresh and new and we get to experience it for the first time. i'm going to be looking for more chances like that. it was interesting to contrast with the experience i had of malevich's works at the tate modern a few weeks ago. there, i knew a great deal about the works and the history and the whole era in which they were produced and i appreciated them in a completely different way. a way that was, admittedly, probably much deeper than my otto frello experience. but that could also be because malevich himself was much deeper. 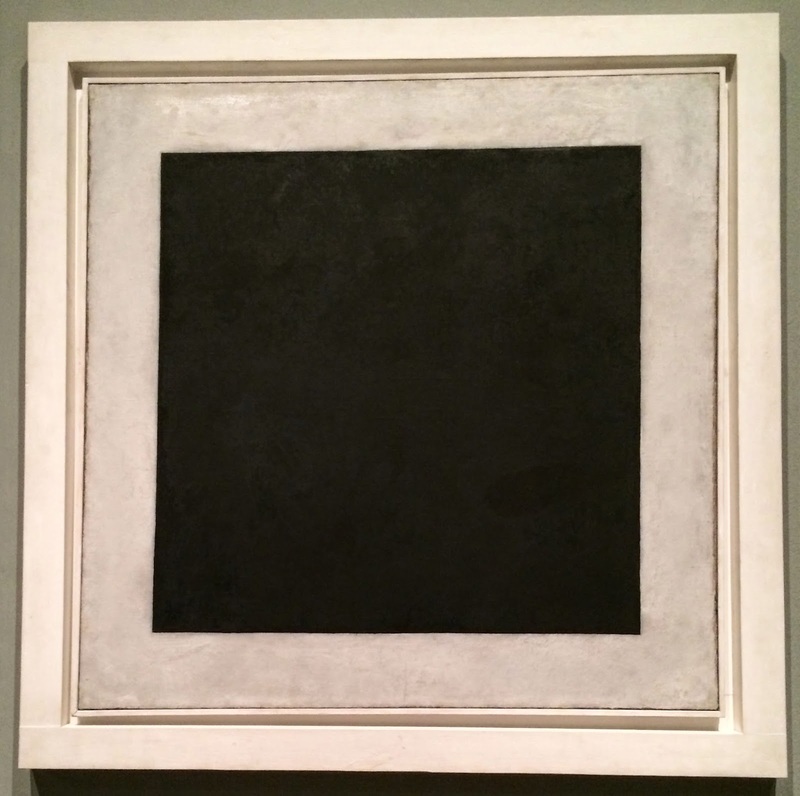 looking at the black square today, it doesn't seem radical, but it was truly radical in its time. and as i stood before it, staring into its black depths, and feeling for a moment a sense of vertigo, i caught some spirit of those times. it struck me that the way in which we experience art matters - whether naively or in an informed way. the malevich moved me much more. it was partially a matter of taste, but also a matter of knowledge and yes, also of talent. but then, the black square was valued at $60 million not that long ago and for one of frello's paintings at the museum, which was for sale, they were asking 300,000DKK ($53,000). a pretty penny for a living danish artist, but ultimately frello is no malevich. and while both experiences were interesting, give me malevich any day. i always think of art museums as places full of people who have long since departed's work. So this is pretty awesome. I love visiting art galleries and art museums ... to me, every visit is a glimpse of human potential, a peek at someone's creativity... the skill and values of unique people. Do I like everything I see? No. Certain pieces have magic in them... perhaps that magic is universally seen ... but I don't think always the case.